The line chart widget plots multiple series of values and visualizes these trends over a period. Line charts also have an optional goal field. Learn more by reading our introductory guide to the line chart visualization. 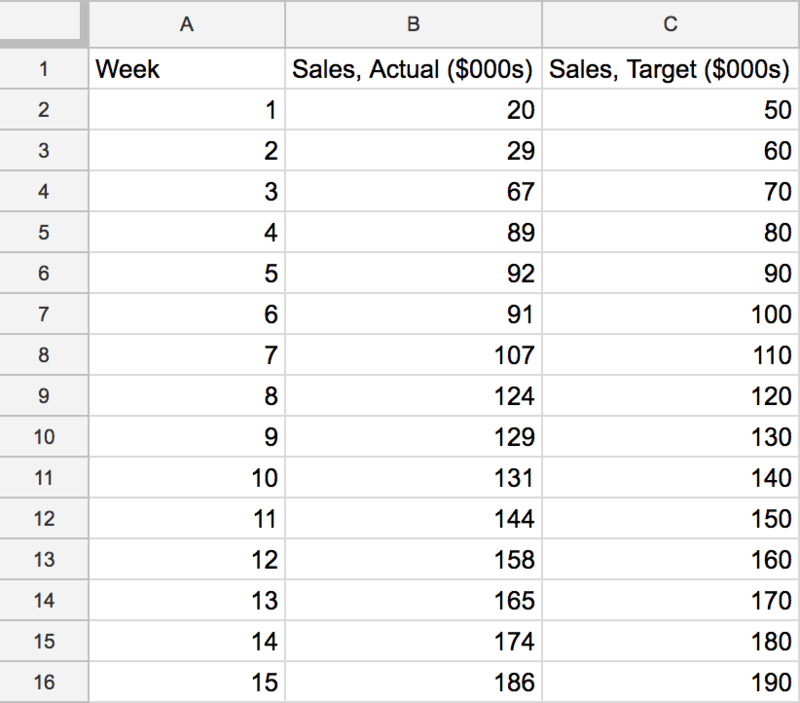 You could create this sales Line Chart by formatting your spreadsheet like the one below. Select the data from your spreadsheet for your X-Axis by either typing in a cell selection (e.g. A1:A13), clicking and dragging over your desired cells, or clicking to select an entire column or row in the Spreadsheet Data area. As you do this, the cells will highlight and you’ll see a live preview of your Line Chart. Click in the Series A field. Select the data from your spreadsheet for your first Series by either typing in a cell selection (e.g. B1:B13), or clicking and dragging over your desired cells in the Spreadsheet Data area. You can add multiple new series by clicking the Add series button. To add a Goal, type in the goal number, or select a particular cell from the Spreadsheet Data area. Grey shading will be added to your Line Chart above the goal line to reflect this. Use the Chart Options toggle to turn on additional options. Here you can specify minimum and maximum values for your Y-axis. To specify the Y-axis minimum and maximum, you can type these in, or select the cells from the Spreadsheet Data area. The Y-axis on your Line Chart will change to reflect this. When you’re happy with your Line Chart, click Add to dashboard. 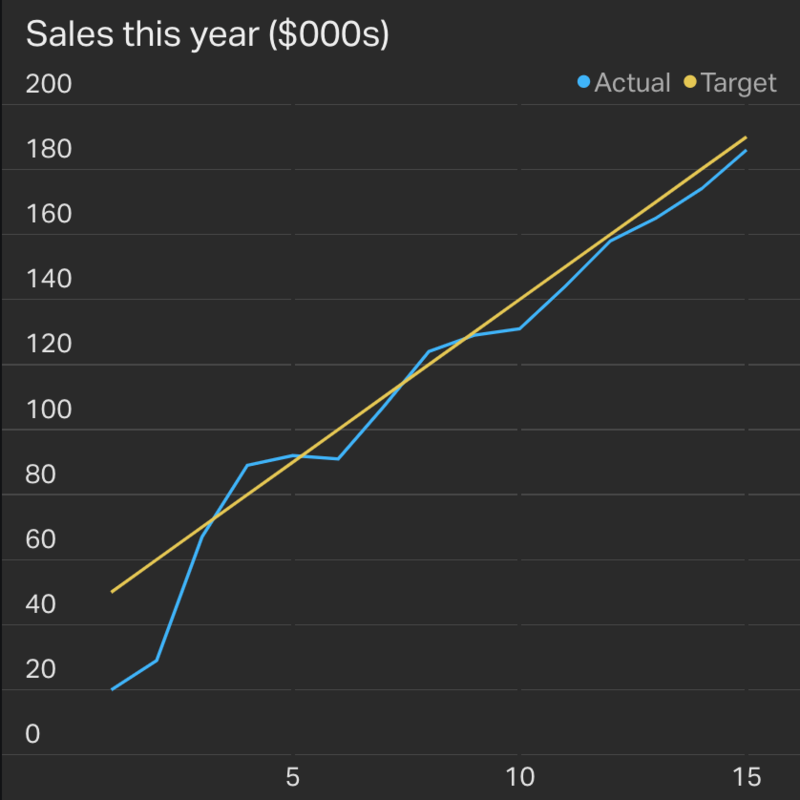 Now that you’re familiar with how to create a line chart, read our dedicated guides to creating the different visualizations available.